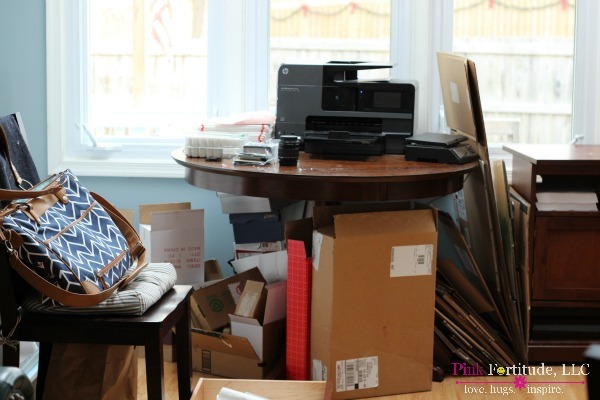 Having a home business and office in addition to all of the “stuff” you need to manage your family can make your space cluttered. If your home business includes selling on Etsy or eBay, you have inventory and mailing supplies on top of everything else. How do you manage to control the clutter from all of the extra items you need to run these kinds of businesses? 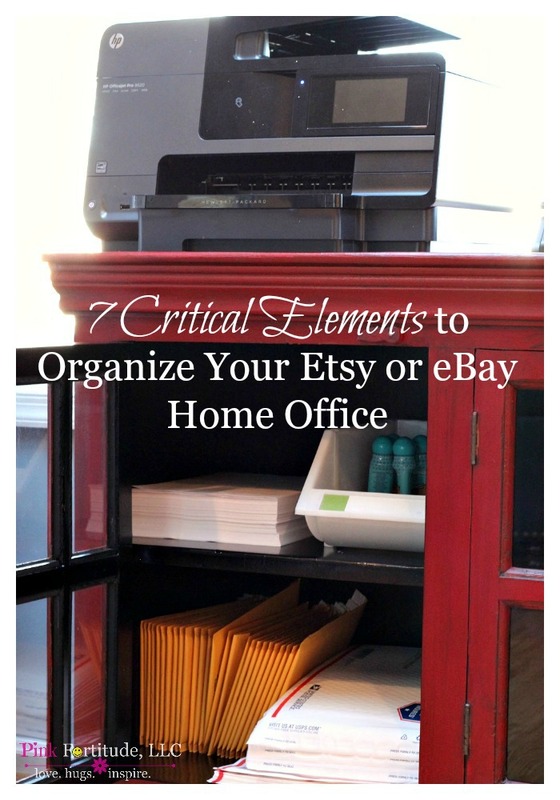 Keep reading for 7 critical elements to organize your Etsy or eBay home office. I’m starting right off the bat by telling you this isn’t necessarily “pretty,” but it is pretty functional. 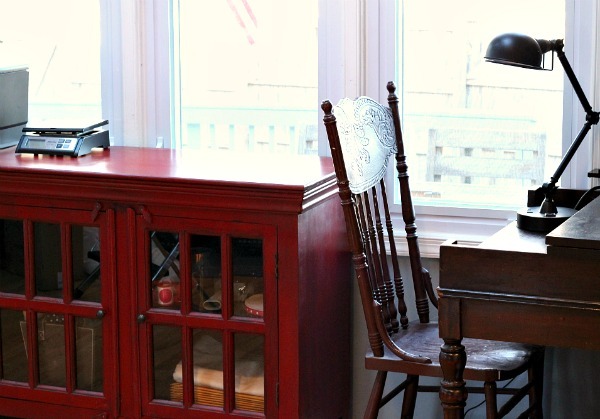 If you run your eBay or Etsy store out of a dedicated home office, I stand in awe of you. If you run your store out of your kitchen or other random space like me, maybe you will find some inspiration here. We run our eBay store out of our kitchen. This is what my work space used to look like. Solidarity anyone? I knew that I couldn’t work long term like this, and the clutter in the kitchen was driving me nuts. When we replaced Hubby’s bookcase on the other side of the room, I went with the matching piece to set up shop. I’m not a huge fan of the matchy-matchy, but since the room is pretty big, these two pieces bring two separate functions of one big space together. I moved the boxes to the closet of our guest room, which freed up a lot of space. Now it’s time to use this space to focus on the mechanics of the business. Yes, quite a difference from the kitchen table and “curb alert” stand. I purposely waited to find the right piece to fit the space – a width that would cover almost the entire wall, and a height that you could still see out the window. 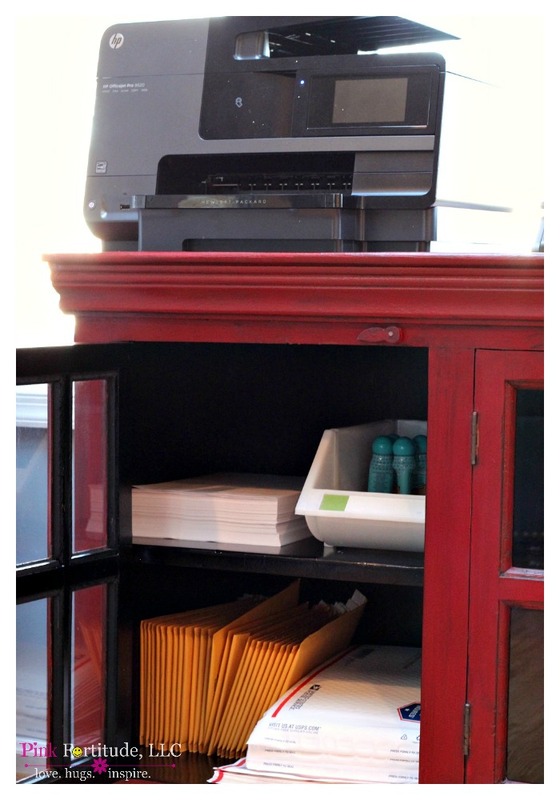 The top of the cabinet is used for mailing, so I keep it empty except for the printer and scale. It gives me plenty of space to box up the items to ship. 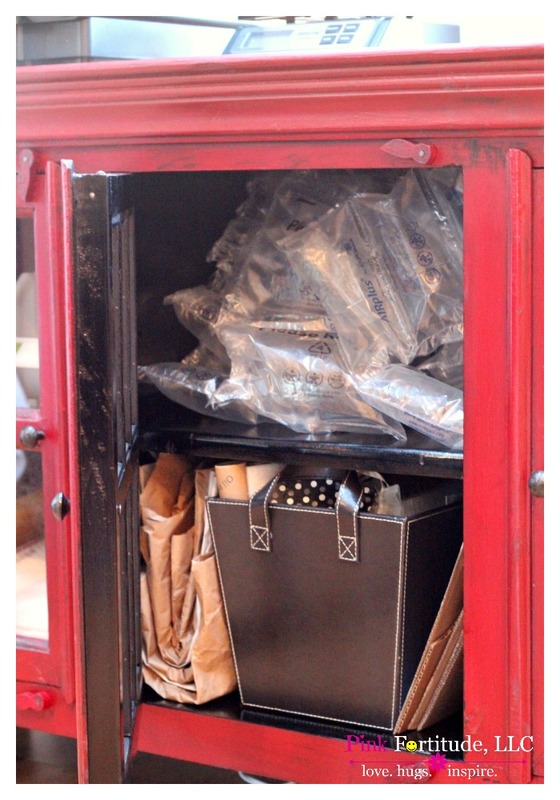 It has the perfect amount of storage space inside, in addition to being a beautiful piece of furniture. In addition to the free mailing envelopes you can get from the Post Office, I use the space directly under the printer for printer paper and my most frequently used padded mailing envelopes. Ahhhh… the dreaded packing supplies. The bane of my OCD organizational existence! I need a room just for bubble wrap LOL! I actually save the bubble wrap and extra stuffing paper from packages that we receive and re-use them. I want the entire end product to look professional to the recipient, but you still need bubble wrap to protect the goods! Even if it doesn’t look like the centerfold of Better Homes & Gardens, I keep the rogue bubble wrap on top, and on the bottom – cardboard excerpts, stuffing paper, and a nicely corralled box of random smaller packing supplies. I didn’t realize until editing was complete how blurry this picture was. Sorry about that! This is my favorite shelf because it’s the one that has room to grow! The bottom shelf contains a different size padded mailer, and on top of it, I use plain recycled tissue paper. 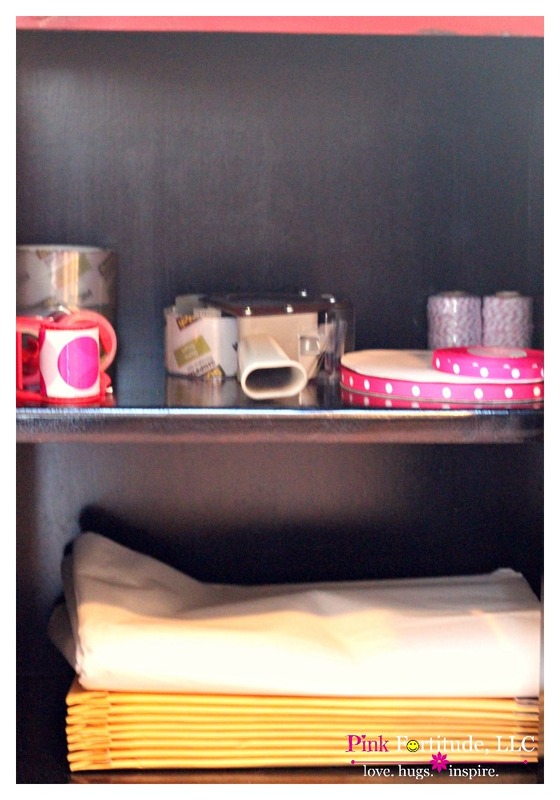 The top shelf contains box packing tape and the materials I use for branding my packages – ribbon and matching accent tape. Not shown in this picture, are the other items I use to complete the package and branding – stickers and customized thank you cards. 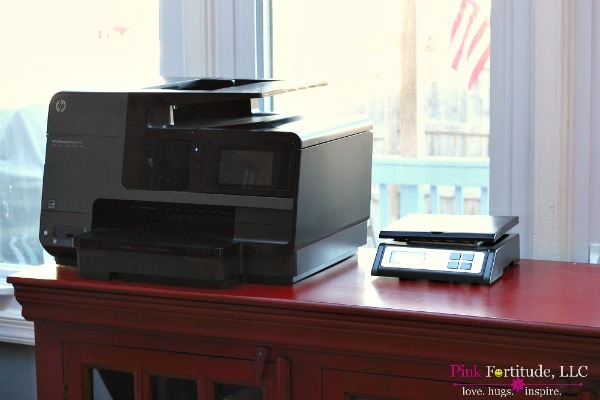 I keep it simple – a home business printer and a heavy duty postage scale. 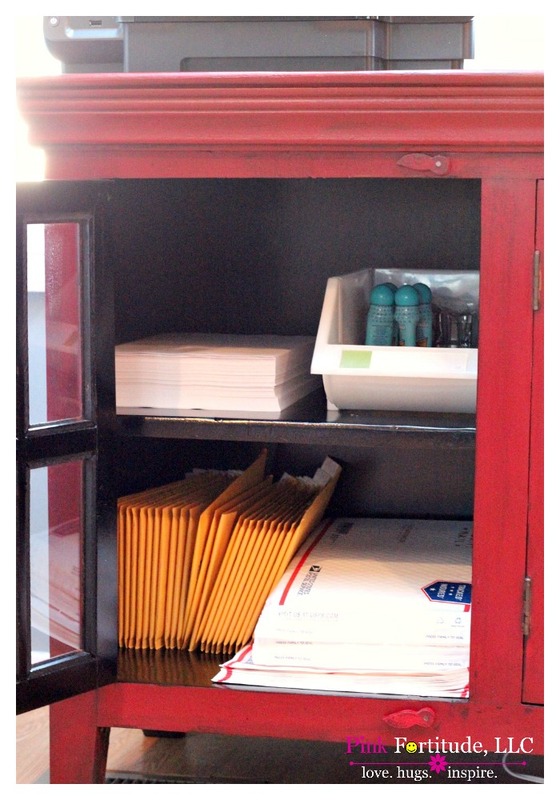 The empty space on top of the cabinet is dedicated to mailing. Next to the cabinet is the desk that my mother had when she was a child. I keep it simple with scissors, pens, a light, and a space to write thank you notes and set my laptop. Again, I don’t have a dedicated office space and I’m working out of my kitchen. You make due with what you have. 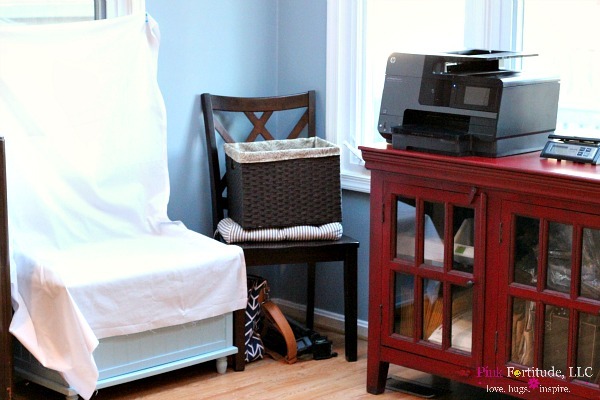 I use this corner for taking all of the pictures for my blog and eBay store. Right now the sheet is tacked up, but I’m going to tie it to some Command hooks so I can remove it when I’m not using it. Camera bag and tripod live under the chair. So there you have it. This is how we run my businesses out of our kitchen. 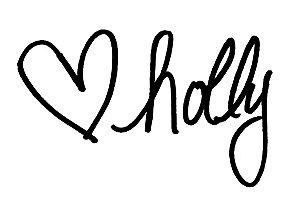 Love, hugs, and being a kitchenpreneur. I love your new office space in your kitchen. 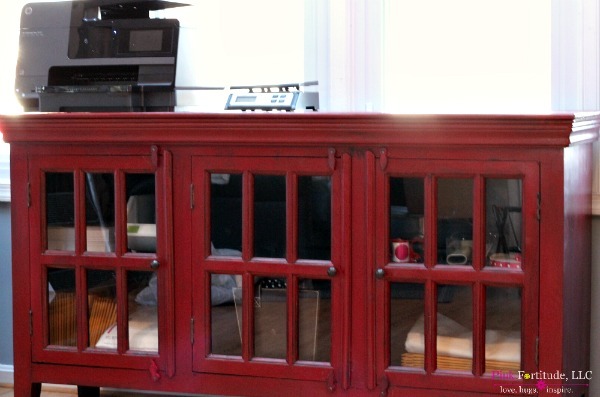 The cabinet is the perfect find to house all your things…looks great! I think you have done a great job based on your space and resources!